When it comes to a seam that conceals all raw edges, French seam and Hong Kong seam finish seem to be first that come to people’s mind. But I think the flat felled seam deserves equal accolade. Flat felled seam is, well, flat. Unlike French seam and Hong Kong seam, there is nothing that sticks out even inside the garment. Nevertheless, I wouldn’t say one seam finish is better than the other. Flat felled seam gives the garment a more sporty look; if that is what you would like for your garment, then by all means give it a try. Most of the jeans you see in the store use this type of seam, although most large scale factories don’t use the method below. Factories churn out this type of seam in thousands, so it makes sense they have very specialized equipment and trained labor that does one thing and one thing only. At home, you could also use a flat felled seam foot for your sewing machine. It does take some practice. The method I demonstrate below is easier to master, although it takes long time to do. I am using a fabric that has distinct right side and wrong side so you can see more easily. With right sides together, put the two pieces at the edge you want to sew. I want to point out that I am using a 5/8″ (1.6 cm) seam allowance to sew this seam. 5/8″ (1.6 cm) is more than what Itch to Stitch patterns usually offer. Is this absolutely necessary? No. You could use 1/2″ (1.25 cm) seam allowance as well, but narrower seam allowance is more fiddly for this method. I wouldn’t recommend using anything less than 1/2″ (1.25 cm). You can easily cut an extra 1/8″ (3 mm) to add to your 1/2″ (1.25 cm) seam allowance if that is what the pattern comes in. Here’s the stitched seam. So far so good? Now I press the seam open. Some might argue that this is not necessary because the seam will be pressed to one side eventually (you’ll see below). But I found that pressing it open first gives a more crisp seam later; it’s a worthwhile investment of your time. Now I trim one of the seam allowance to half its width. Which side to trim? There’s no rule; it’s all about esthetic. For example, if this is the side seam, and you want the visible stitch line to be more toward the back, then trim the seam allowance that belongs to the back. Now press both the seam allowance to one side, with the wider seam allowance over the trimmed seam allowance. Tucking time! Now tuck the wider seam allowance under the narrow seam allowance. Pin. This is the partially pinned shot. Keep on going pinning the entire seam. I also does this one, some might call, “extra” step. I baste this seam by hand. There’s no need to do an impeccable job here; the purpose is that I want to hold this seam down, so when I stitch from the right side later, it will not move. However, some people could just stitch this seam from the wrong side, skipping the basting stitch. No judging from me if that’s what you’d like to do. Supposedly if your machine produces a balanced stitch, the right side and the wrong side produce the same look anyway. But why do I make this extra step of hand basting? I’d like to topstitch from the right side, so I can use the seam line as a guide and view it from the standpoint of the finished garment. I could spot crooked stitching and correct it if necessary. I remove the basting stitch and give it a good press. Here’s the right side of the seam. One stitch line is visible. And here is the wrong side of the seam. Two stitch lines are visible. Do you notice that the wrong side is kinda pretty too? You could very well use that side to be your right side! That way you would have two visible stitch lines. Of course that mean you would initially put two WRONG sides together instead of putting the right sides together. That decision is completely up to you, and it is still a flat felled seam regardless the side you use. Hope this is helpful to you. 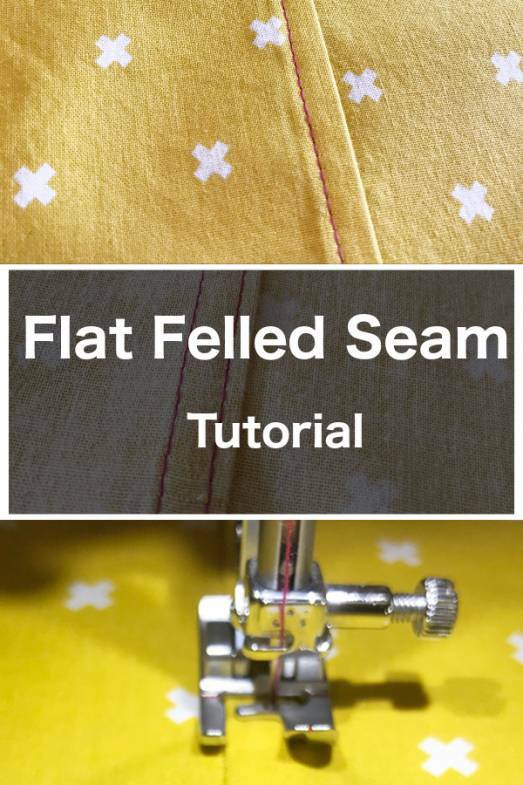 What is your experience with flat felled seam? Have you used this method? Thank you!! I have read a few tutorials on flat felled seams, but none as clear as yours. Between the distinct right/wrong sides, the visible thread color, and the great photos, you knocked it out of the park! NOW I’m excited to try this seam!! Thanks for sharing! This is a very good tutorial and I will definitely use it. I just want to compliment you on your ability to explain instructions. I just came from another blog, and even though I know and have used the process she was describing, her explanations were completely confusing. Thank you for your generous — and perfectly detailed! — help. I use this method when making long sleeve woven blouses/dresses. But I start with wrong sides together. That way the double stitching is on the outside of the sleeve. And if I need to roll the sleeves up it still looks nice. I don’t know if my previous comment posted? Here is a link to Janet Pray’s method. Thanks for linking to her method. It’s brilliant indeed. I prefer the method taught by Janet Pray in one of her Crafsty classes…no trimming required, no tucking under, no basting. I recommend her course just to learn her flat felling method. Which one of her classes has this? Great tip. Love how simple yet looks completely finished. I’ve done it this way before. I like it. No messy seams or fraying to show. Well done with the tutorial!